Another fearsome battle between the two arc enemies has been fought this evening. Nothing complicated, just three objectives and 1300 points. When I made my army list with the goal to surprise Kristian as much as possible. Normal I bring lots of troops and a couple artillery. 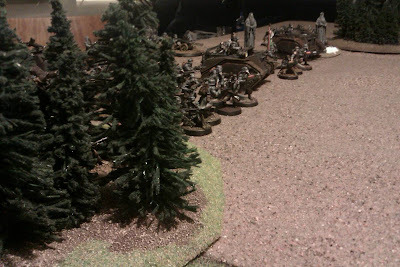 Tonight I used a combined squad with a commissar as leader which turn out to do more then well. 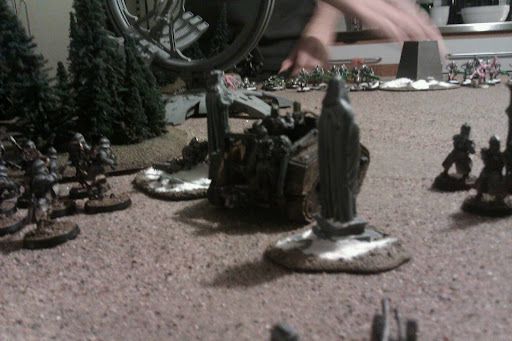 I also had a hellhound and three centaurs to make the army flexible and fast. I set up first and Kristian ceased the initiative. This was more then good for the tin men since my complete army stood on open ground ready to marsh forward and fire as much as possible. Instead the humans died as flies. The doomsdayark killed 11 men the first shot. When it was my turn to fire back my medusa killed five imortals leaving one and four of them raised up again from the pile of junk they had became. As always Kristian had the control of the complete game. But still it was close. I love the new Necron rules, they feel so much more balanced. In the end of the game I rushed my centaurs over the battlefield to make a contest of the objectives but unfortunatly Kristian wiped them all out. The battle was super fun and learned that a hellhound can make metal burst into flames. 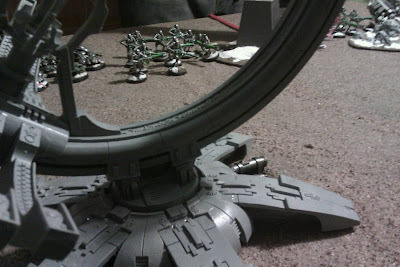 The pylon was just so cool that that we had to have it as an terrainpiece. Not really. Man parts didn't come with the robot body... so, yeah.